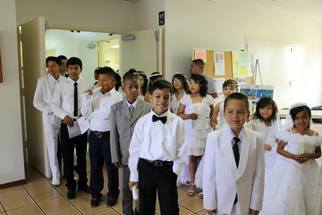 If you wish for a First Communion for a child, please call 512-836-3974 or send an email to info@austinstjohns.org to obtain a date. You can also come to any service and contact the rector after the service is over. Be a member of St. John's for a minimum of 6 months. Attend 24 Sunday School classes and one class with the Rector. The classes can be attended sequentially, or in whatever order you choose. There is no charge for a First Communion though donations out of gratitude are common. We suggest a donation of $50 to help cover the cost of the materials for the class.